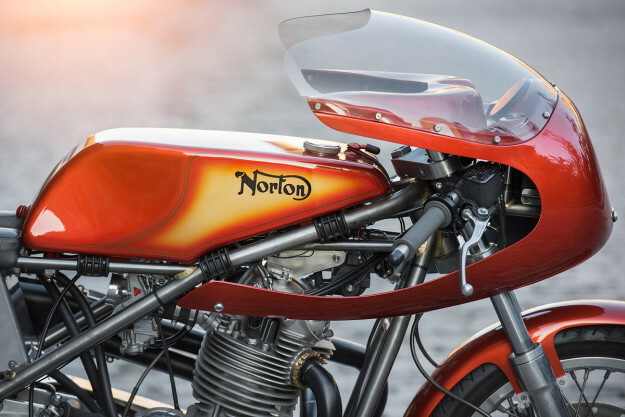 If you live on the east coast of the USA and you need work doing on your Norton, there’s only one person to call: Kenny Cummings of NYC Norton in Jersey City, just outside Manhattan. 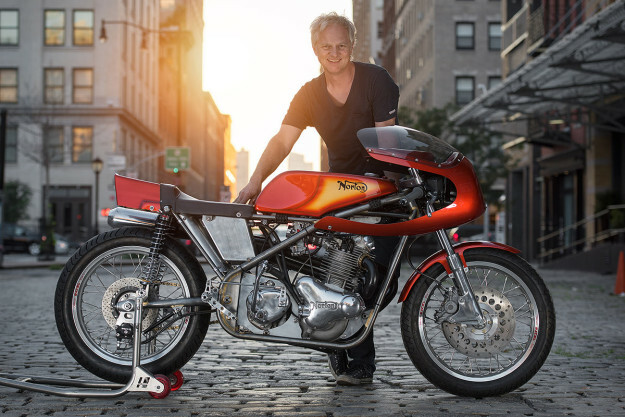 Kenny’s a household name on the global Norton scene. It’s not hard to see why—his builds are an exquisite blend of performance and style. And, as with most old British iron, there’s usually a good story too. 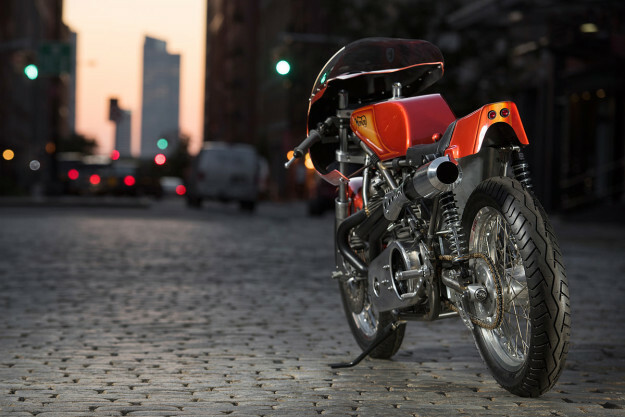 A new concept was required, and a ratty 1972 Commando appeared on the radar. It had lived a rough life: the crankcases even had a sloppy weld on the drive side half, a telltale sign a rod had broken through. Kenny decided to use as much of the donor as he could, while fitting some robust and reliable racing parts. He sourced a Maney lightweight crank, alloy cylinders, a Fullauto head, and JE 73mm forged pistons. 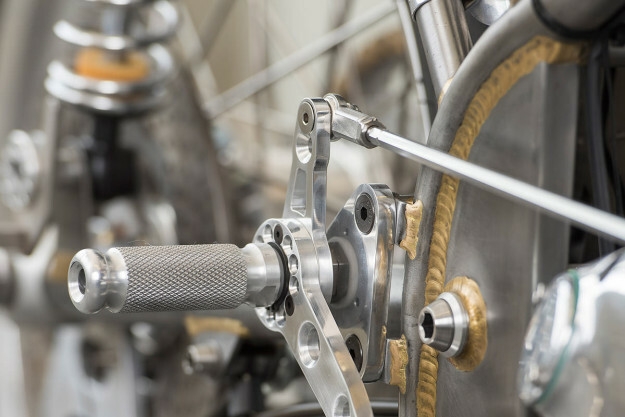 The crank was balanced to 74%, the same factor used by NYC Norton’s championship-winning Seeley Commandos. A pair of custom alloy fork yokes went on, set up with a pinch-bolt top for quick geometry changes. Falcon shocks were fitted to the rear. The rims are 18-inch unflanged alloy, WM3 at the front and WM4 at the back. 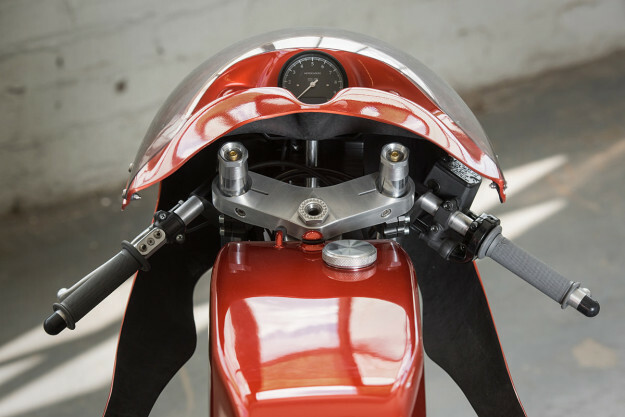 A neat touch: the rear wheel was built using a two-piece Triumph T140 replica billet hub, along with a Maney cush drive to give the gearbox a little relief from quick shifts and injudicious throttle use. Tires are Bridgestone BT45 Battalaxes. 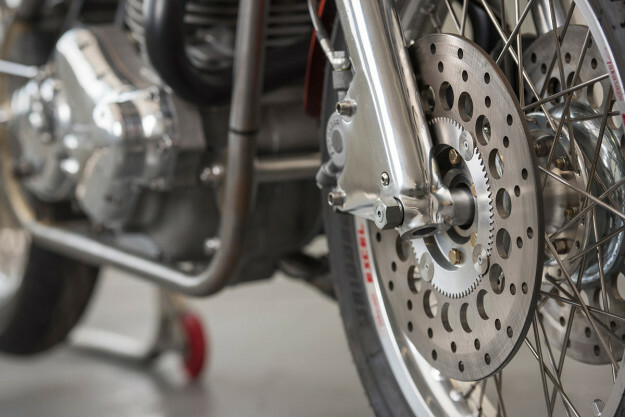 The primary side of the bike was built using a 30mm belt drive that increases the primary ratio—meaning less torque shock to the gearbox. There’s also a trick high-output alternator, keeping a low profile behind the alloy belt guard cover. 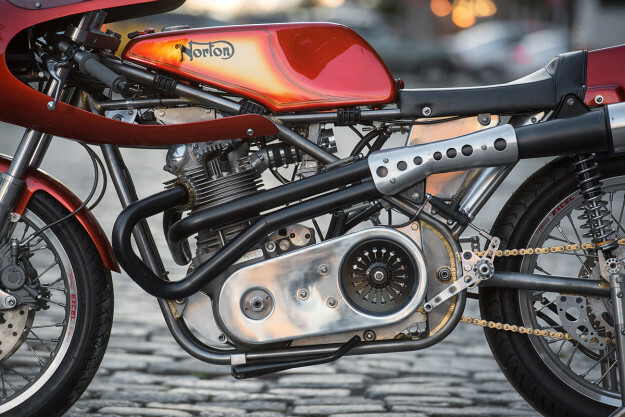 The vibrant color scheme is certainly a departure from the more conservative natural alloy or black and gold chosen by most of NYC Norton’s Seeley customers. “Later, while sitting in my home studio, an idea dawned on me as I sat plunking out some parts on my guitar. I realized this was a motif that was very important to me—the cherry sunburst of my favorite vintage Gibson Les Paul. Brent laid out the Norton logo and pins in a gold undercoat, then sprayed the major color over. 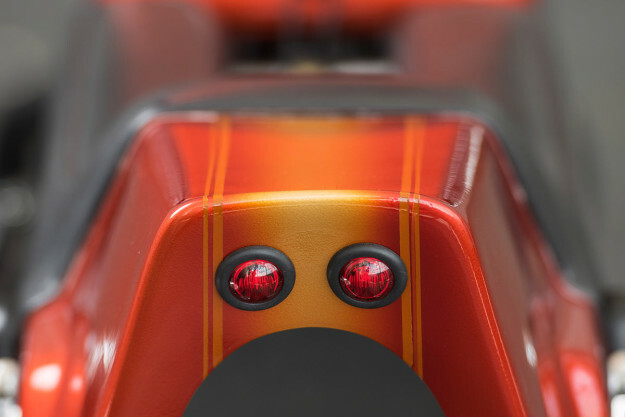 Once the bodywork was back, the bike was buttoned up in short order. Kenny called his old friend and fellow racing competitor, the photographer Doug MacRae. It was time to shoot. “This is a serious bike,” says Kenny. 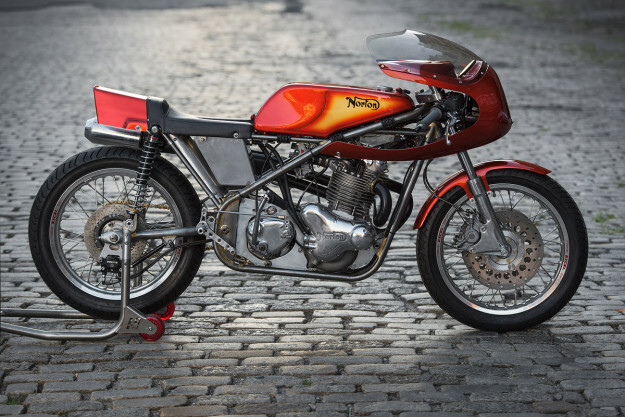 “It’s pretty, but its foundation is a top-spec, competitive 750 racer weighing 300 pounds, adapted for the street. 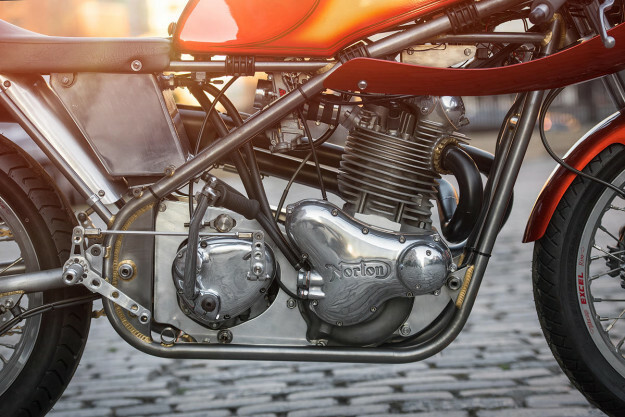 The NYC Norton site has a wealth of riveting detail on this build. But don’t head over there unless you’ve got time to spare—and a firm grip on your credit card.